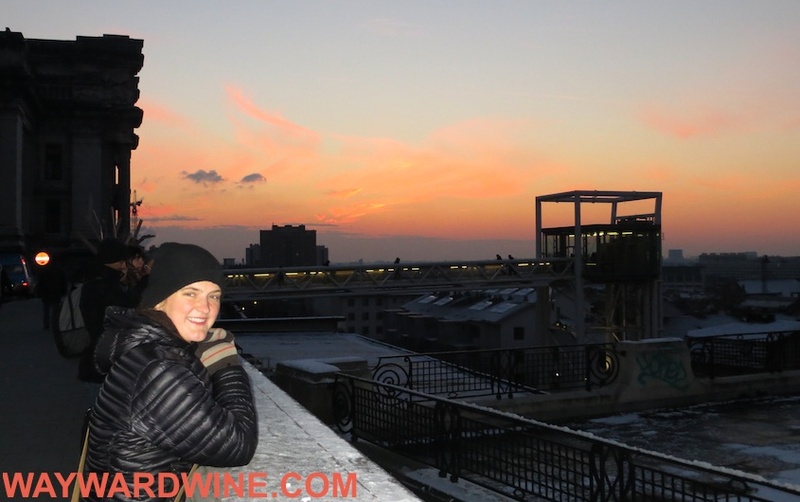 176 days of continuous trekking through Europe’s wineries, breweries, and distilleries finds Wayward Wine in Brussels. 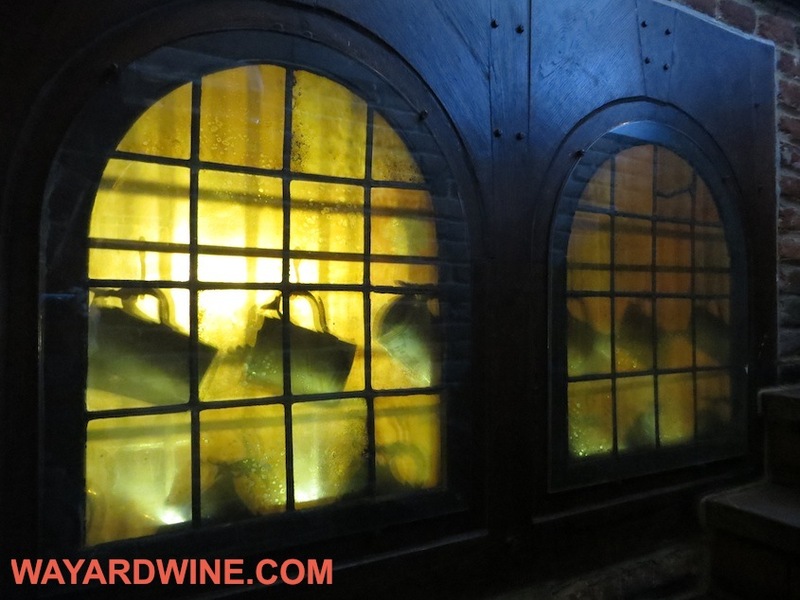 Antwerp brought a brilliant brewery and Rubens, in our last post (reread here). But for the next three days, we stay in a loft with a young Italian and French couple. 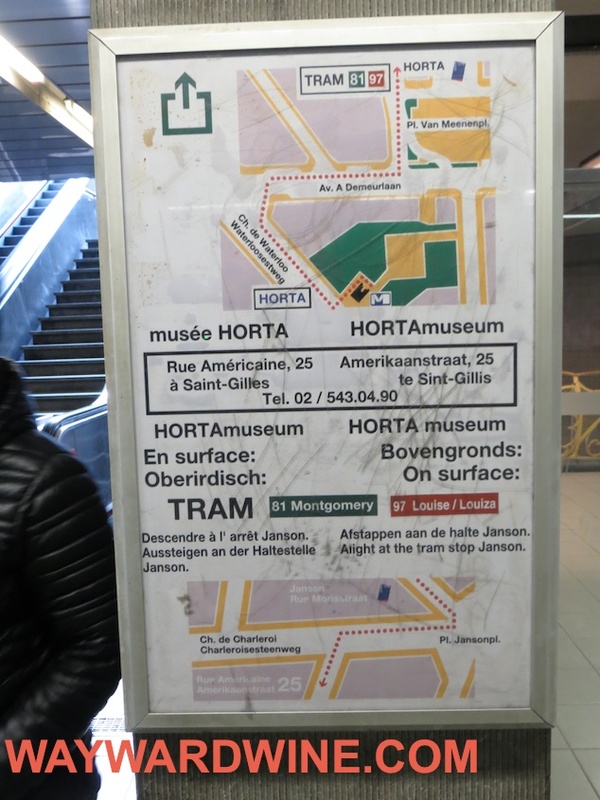 We grab food and then manage to Metro the wrong way looking for the Horta Home and Museum. For you non art people, Horta defined Art Nouveau’s wild, organic flourishes with his famed posters. But the map only confuses us more. We almost pass his unassuming home on a side street. 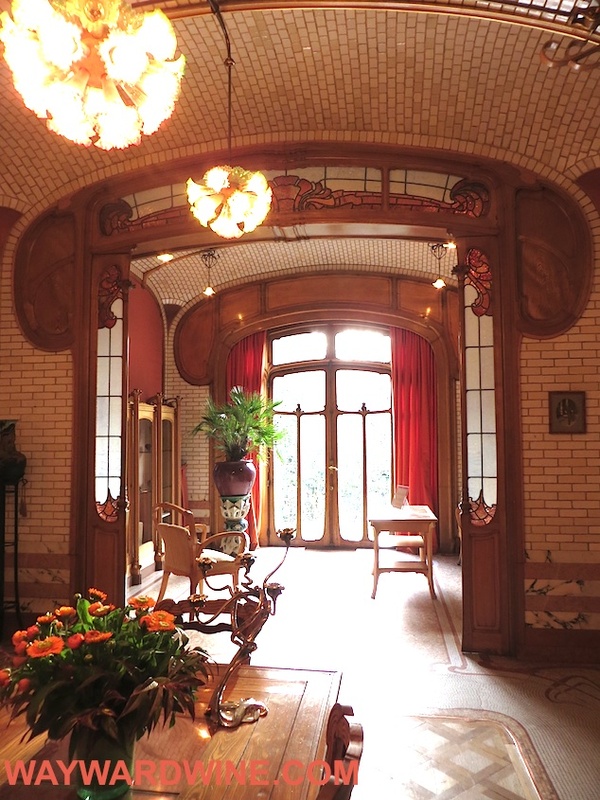 But inside we open a pandora’s box glowing with custom Art Nouveau perfection. 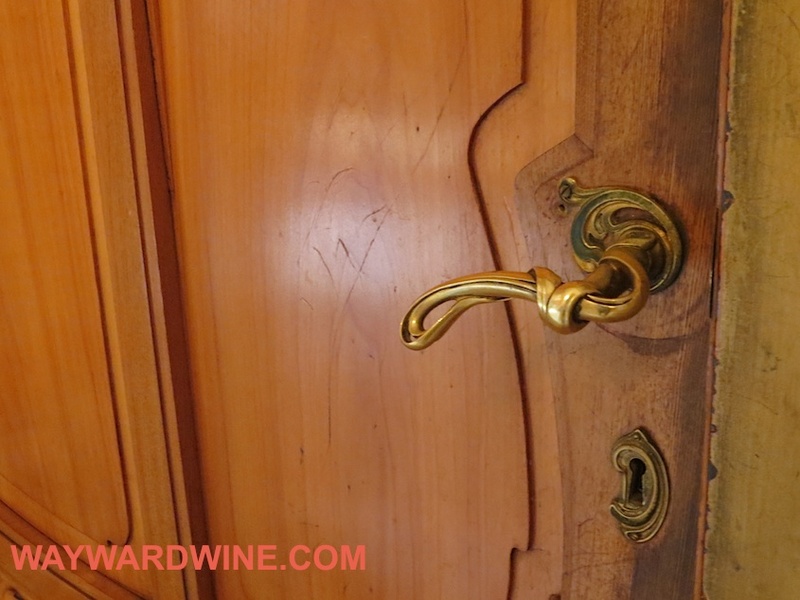 Every inch oozes and weaves hand-turned wood curves and bronze details. Yet Horta’s home is hardly grand. It feels cozy and comfortable. All these warm woods help us forget the snow and slush outside. 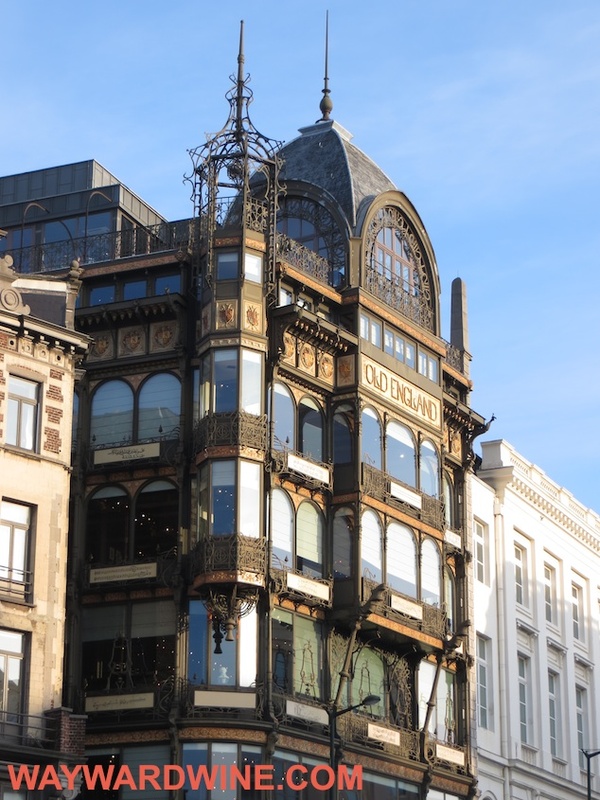 Barcelona was an extravagant mess of Dali built Art Nouveau. Horta’s sense is more restrained and tightly wound yet soothing. Exhausted for the day, we return to our loft apartment. We introduce our hosts to a South Park episode with a guinea pig apocolypse. Beer finishes our night. 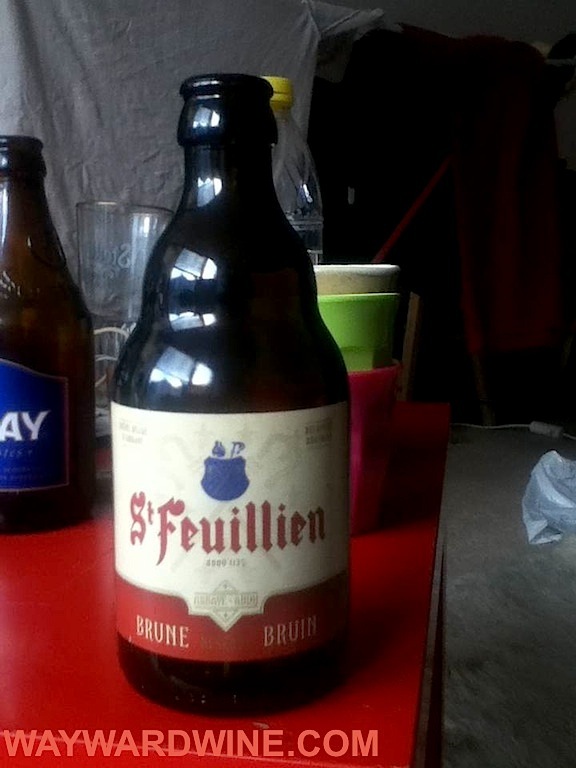 St Feuillien (Abbey Beer), Bruin Réserve, le Roeulx, Belgium. €1.18 / 33cl APPEARANCE: looks a hazy, rich brown, with lean caramel lace. AROMAS: seem fairly full of red licorice, raisin, vanilla, and chocolate. PALATE: feels sweet, moderately tart, with medium sandy tannin, medium plus alc 8.5%, and a medium plus body. FLAVORS: however, disappoint, hiding behind an alcoholic burn and sweetness tasting vaguely of licorice, raisins, and toast that last a medium length. This is fine (3 of 5) but lacking. Luckily their Blond is better: St Feuillien (Abbey Beer), Blond, le Roeulx, Belgium. €1.18 /33cl bottle APPEARANCE: looks hazy again, with a medium lemon color, small bubbles, and white lace. 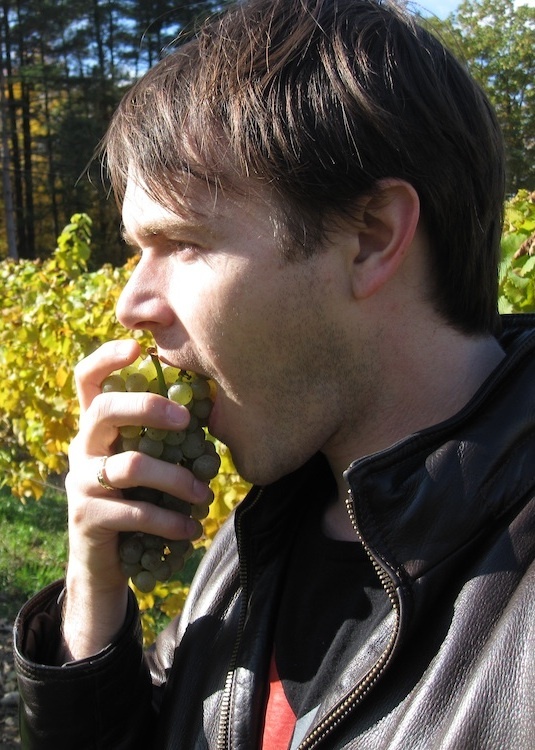 AROMAS: waft up with medium plus intensity aromas of Chablis, lemon curd, grain fields, and violet perfume: lovely! PALATE: feels dry, pretty twangy, mildly bitter, warm enough at 7.5% alcohol, with a medium body. FLAVORS: are a medium plus melon, lime, salt, with a hint of curry spice, licorice, and honey that last a medium length. St Feuillien’s Blond is complex, balanced, and refreshing: very good (4 of 5). Gold labels are usually a sign of awesomeness. APPEARANCE: a bright but hazy, lemon color, with a white head. AROMAS: smell notably green of hops, tobacco, and grapefruit. PALATE: feels dry, tart, moderately hoppy and bitter, with a high alcohol of 9.5% which feels only medium bodied thanks to ample acidity. FLAVORS: taste of strong Herbs de Provence, green and golden apple, lemon, with a medium plus cinnamon finish. 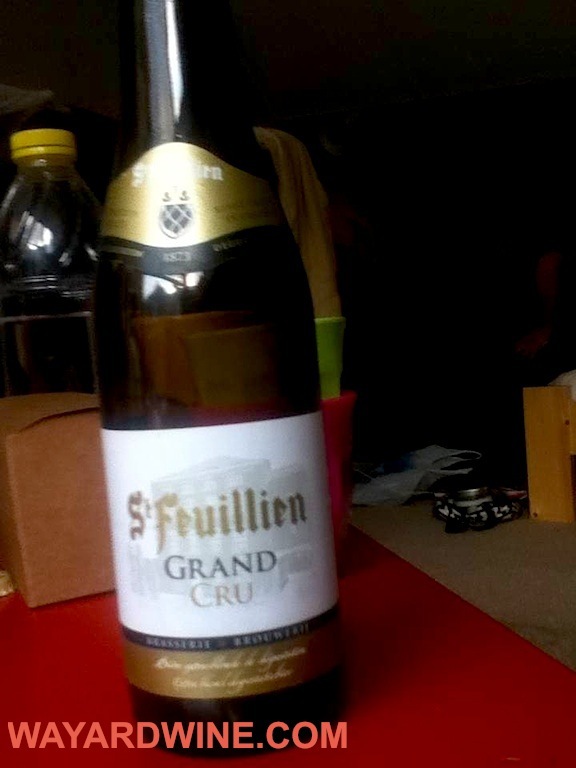 St Feuillien’s Grand Cru is beauteous, bright, and bountiful silk. Delicate yet dangerous. Outstanding stuff (5 of 5). 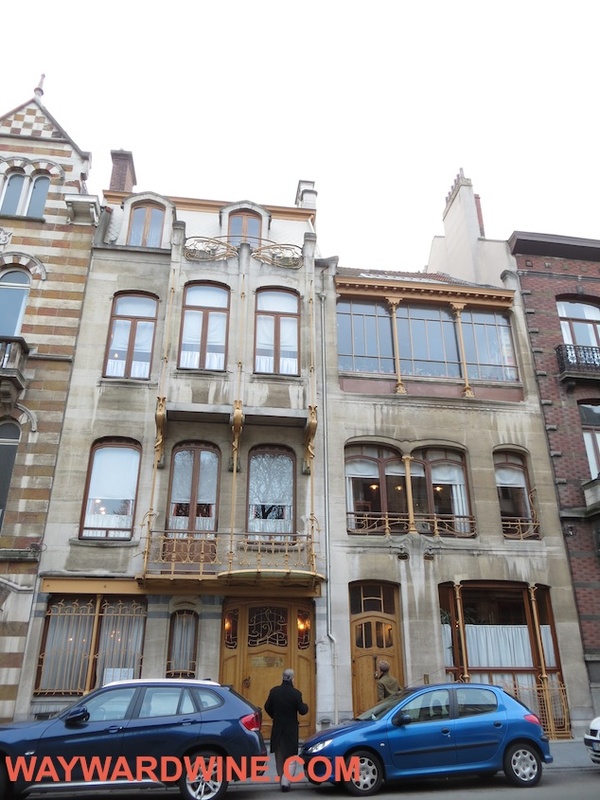 The next day, recharged by a pine nut, pistachio panettone, we explore Brussels on foot. The Royal Palace dominates a hill above the city, cool and neoclassical, but we move on. 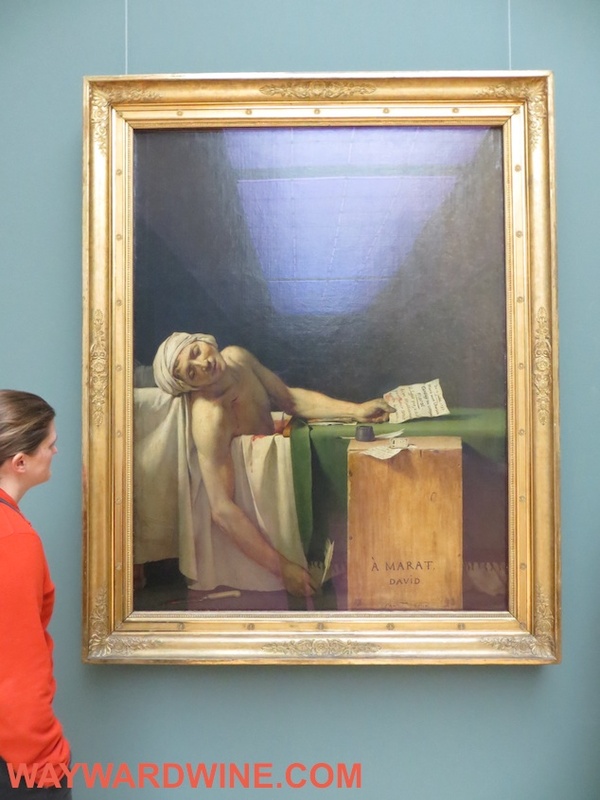 Maxed out on decontextualized artworks, we hit the pavement. We descend from this hilltop of high art passing the outstanding, steam punk, iron-wrought Old England building (now Music Museum). 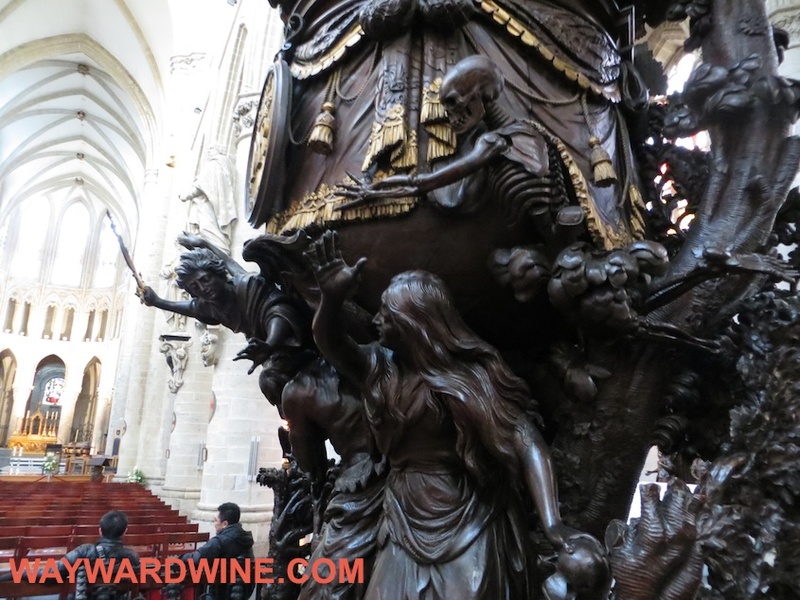 Brussels’ cathedral continues the elaborate trend we’ve seen throughout Belgium: ornate pulpit woodwork. This being Belgium, we of course stick our heads into the Guild of Brewers, which has a pub with a small museum. However, we have beer back at the loft and this is an austerity tour after all. We get bored by the repeating chocolate and lace shops. Venturing widely, we find the Manneken Pis statue surrounded by a hoard of tourists and pickpockets. 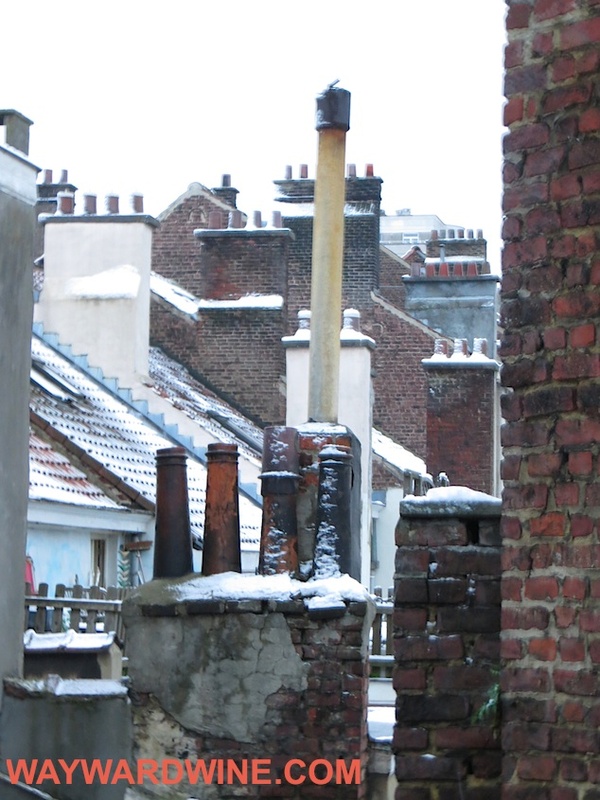 The crumbling city walls interest us more, as does the view over Brussels as a cold sun sets. We do not love Brussels. Ghent and Antwerp charmed our respective pants off. 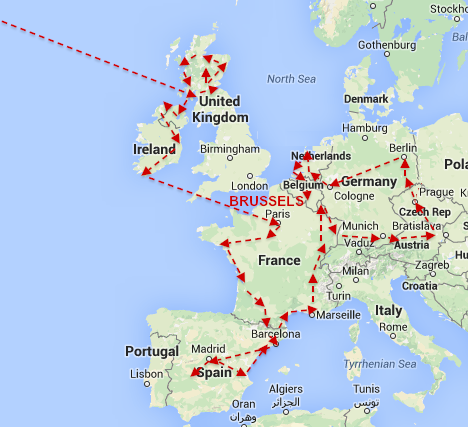 But Brussels suffers from monotonous tourist traps and just being too big (especially without a car). Nevertheless, beer is brilliant and inexpensive. And lest we forget, France is next door. 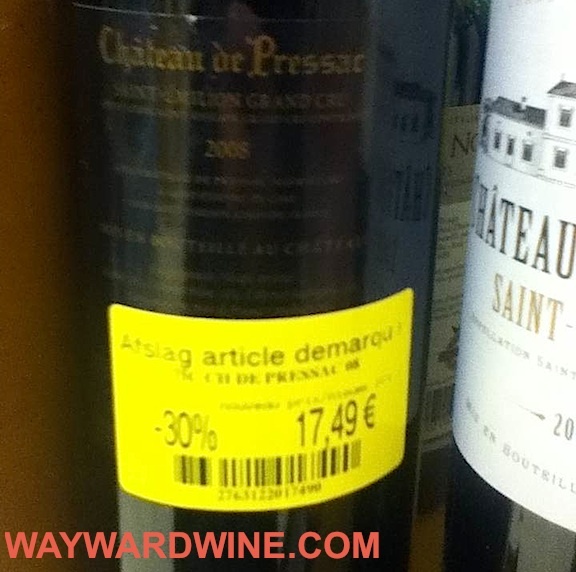 A basic grocery store sells Saint-Emilion Grand Cru 2008 Chateau de Pressac for 17.49 EU Chateau Tour du Cauze is 10.39. Hell, Remy Ferbras Chateauneuf du Pape is 11.67. Inspired, for 2.50 we catch a train and then bus to Waterloo: site of Napoleon’s last defeat. Check in tomorrow for that special post. 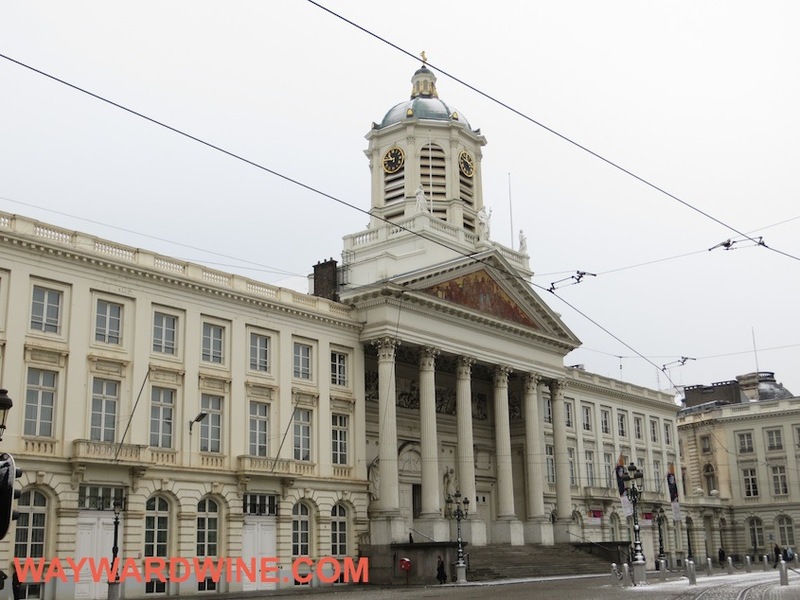 This entry was posted in Uncategorized and tagged Beer, Belgium, Brussels, drink, St Feuillien, travel, wine. Bookmark the permalink.